During a town hall meeting on NBC’s Today show, he said he believed in raising taxes on the wealthy. And at least half, 51 per cent to be exact, of Trump’s supporters agreed with him. So Trump cut corporate taxes that he said would benefit the middle classes. Lily Batchelder, a law professor at New York University and visiting fellow at the Tax Policy Center said – “If you look at the most wealthy, the top 1 percent would get about half of the benefits of his tax cuts, and a millionaire, for example, would get an average tax cut of $317,000,” she says. And Batchelder was right on the mark. 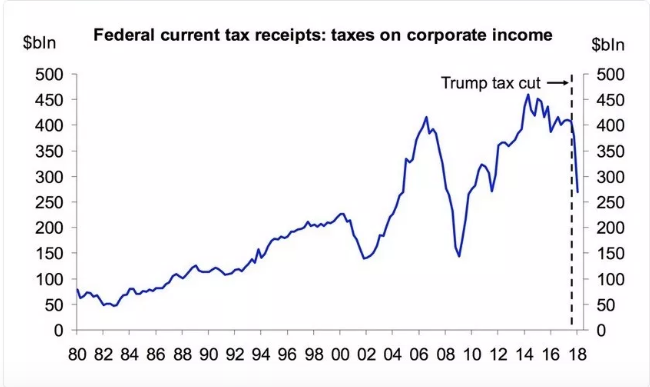 The graph shows a fall in US government tax reciepts of 31 per cent. This is a still an ongoing fall and is as steep a fall in government tax revenues as the rapid decline experienced just after the bank led financial implosion of 2008. These tax cuts are the biggest since Ronald Raegan came to power, who, along with Margeret Thatcher ushered in a period of neoliberal capitalism that is yet to fully unfold but that so far has seen sustained long-term rises in inequality that is blighting society across the Western world – leading to the rise of populist movements. From TaxJusticeNetwork – We’ve previously blogged on Donald Trump’s plans for cutting corporate income tax, and now they’ve come to fruition we can see the results as far as the USA is concerned. Tax receipts are plummeting, despite the economic boom stimulated by his predecessor’s QE programme. Commentators have widely predicted that this will inevitably lead to a widening deficit, greater inequality, and harmful impacts on other countries as tax competition pushes the race-to-the-bottom, but these are just details! Trump is not the first politician to be seduced by the alchemy of Arthur Laffer’s (Laffer is best known for the Laffer curve, an illustration of the concept that there exists some tax rate between 0% and 100% that will result in maximum tax revenue for governments) phoney curve, and he won’t be the last, but it’s not encouraging that they just keep on doing this despite the mountains of evidence refuting the idea that tax cuts yield higher long-term revenues. Meanwhile, and notwithstanding the calamitous harm inflicted on the state of Kansas, which took the tax cutting route to its logical conclusion, some politicians just keep lapping up Laffer’s snake oil. And yet, as the New York Times reports Trump is considering another wave of tax cuts, this time directly aimed at the most wealthy – “The Trump administration is considering bypassing Congress to grant a $100 billion tax cut mainly to the wealthy, a legally tenuous manoeuvre that would cut capital gains taxation and fulfil a long-held ambition of many investors and conservatives.” The excuse this time is to allow for inflation within capital gains tax for the life of the investment – just another tax break for the wealthy in particular. This is the result of supporting right-wing populists who deliver little more than deception disguised as favourable outcomes through distorted statistics – a type of fake news if you like, something Trump is really hot on when it suits!